Storm lashes California and leaves polluted water – Yahoo! News. The Associated Press: Rain-soaked Calif. braces for biggest storm yet. LOS ANGELES (AP) — After days of relentless rain, Southern California was bracing for the most intense storm system yet, with evacuations ordered, roads covered by water and mud, and residents anxiously eyeing already saturated mountainsides denuded by wildfires. Forecasters expected heavy rain to move into Arizona, Utah and Nevada on Wednesday, but the focus clearly was on Southern California, where a monster storm was expected to bring torrential rain, thunderstorms, flooding, hail and possible tornadoes and water spouts. Officials warned of possible rainfall rates of 0.75 inch to 1 inch an hour and thunderstorm rates of 2 inches an hour in the region. Steady rain began falling late Tuesday and was expected to intensify. A rain-soaked hillside collapsed on part of a busy Interstate 10 transition road Wednesday as overwhelmed drains left hubcap-deep pools of water on roadways littered with fender-bender crashes. The landslide covered three lanes of the transition to State Route 57 in the Pomona area, and the California Highway Patrol shut down part of the ramp before the morning rush hour. In Orange County, rain-loosened boulders and mud blocked access to mountain homes in Silverado Canyon near the Cleveland National Forest, and firefighters were helping residents walk out of the area. Downtown Laguna Beach was closed as up to a half foot of storm runoff flooded the streets, and mudslides were reported in the San Clemente hills. Officials on Tuesday ordered evacuation of 232 homes in La Canada Flintridge and La Crescenta, suburbs of Los Angeles below steep hillsides that burned in 2009 and where mudslides inundated homes and backyards in February. Walt Kalepsch said his backyard filled with mud and debris last winter, but he planned to stay the night with his wife and daughter. As the “Pineapple Express” system swept Pacific Ocean moisture across the southwestern U.S., Gov. Arnold Schwarzenegger declared a state of emergency in six counties. The huge and powerful low pressure system off the West Coast pushed precipitation right into the Great Basin. Flood warnings and emergency declarations were in place in parts of Utah, Nevada and Arizona. Rushing water ripped through a northwestern Arizona retirement community Tuesday, sweeping away four unoccupied homes near a normally dry river bed and threatening to destroy others. About 60 miles away, evacuation orders for the entire town of Rockville, Utah — population 247 — were lifted after a dam feared close to breaking was declared safe. Nearby Zion National Park also was evacuated and shut down. In southern Nevada, a state of emergency was ordered after rain-swollen creeks closed some roads in the Las Vegas area and snow disrupted electricity to about 300 customers on nearby Mount Charleston. With rain falling up and down California, Sierra Nevada ski resorts boasted of record-breaking December snowfall, with the storms bringing 10½ to 15½ feet to Mammoth Mountain. Rescuers had to pluck some stranded motorists from rain-swollen creeks. Shoppers dodged puddles while buying last-minute Christmas gifts. Disney resorts canceled a plan to shower visitors with artificial snow. At least six people were rescued from their cars in Laguna Woods before dawn Wednesday after they drove around barricades on flooded roads, authorities said. Parts of the San Gabriel Mountains got more than 18 inches of rain since Friday, with coastal cities like Santa Monica and Long Beach getting more than 6 inches, the National Weather Service said. Water content in the snow pack in California’s mountains was at 197 percent of normal and 169 percent of the average measurement for April 1 — traditionally the date when the snow’s water content is at its peak, said Ted Thomas, spokesman for the California Department of Water Resources. California awash in rain, snow and mudslides – CNN.com. Are you affected by the weather? Share your images, videos with CNN iReport. Check out CNN affiliates KABC-TV, KTLA-TV and KBAK-TV for local reports. Los Angeles (CNN) — Storm-weary Californians, some driven from their homes, faced another day of record-breaking snow, rain and flooding as the latest in a series of storms deluged the region, forecasters said Tuesday. Residents were keeping a nervous eye on hillsides, wary of the potential for mudslides. Donna McLaughlin of La Canada Flintridge lost her home last year when a 10-foot wall of mud came barreling down a hillside. She just moved back in October. “Here we go again,” she told CNN affiliate KABC. But this time, the city has bolted down protective concrete barriers and attached them to each other in the area in an effort to guard against mudslides. McLaughlin said the barriers were not bolted down or attached last year. “Had they done that, our house would have at least been saved,” she told KABC. In Orange County, efforts to rescue four hikers whose truck was stranded by floodwaters between two canyon roads were under way on Tuesday, CNN affiliate KTLA reported. The four were located just before 8 a.m. Tuesday and are all right, officials told the station. The Los Angeles Times said a helicopter would fly them out of the area. Five other people were rescued Monday evening, KTLA said. Elsewhere, 40 horses were rescued from Riverside County as water rose to heights of about 4 feet, affiliate KCAL reported. The storm is actually a series of storms originating in the Pacific, known as the “Pineapple Express” because of their origin near the Hawaiian Islands. They have brought heavy snow to the higher elevations, with torrential rainfall in lower spots, and high winds. Total rainfall has approached 10 inches in some areas. Some parts of the state, such as the San Joaquin Valley, will see a break in the rainfall Tuesday, but flash flood watches remained in place across much of the southern part of the state, with winter storm warnings for higher elevations. Even scattered thunderstorms with small hail and waterspouts are possible in some areas late Tuesday, the National Weather Service said. Numerous roads were closed because of mudslides or flooding. On Monday, nearly 2,000 residents near McFarland, about 40 miles north of Lamont, were evacuated because of what fire department spokesman Sean Collins called “major flooding.” The evacuation order was later lifted after debris was cleared from a backed-up creek. Meanwhile, as much as 13 feet of snow fell in the Sierra Nevada, according to CNN Meteorologist Rob Marciano. “We get a lot of snow here, but not usually this much in a 24-hour period,” said CNN iReporter Sarah Butner, who is visiting family in Mammoth Lakes, California. The area has received about 9 feet of snow, she said Monday. “The decks have a good 5 feet of snow on them,” she said. One area of the neighborhood was also flooded, she said. 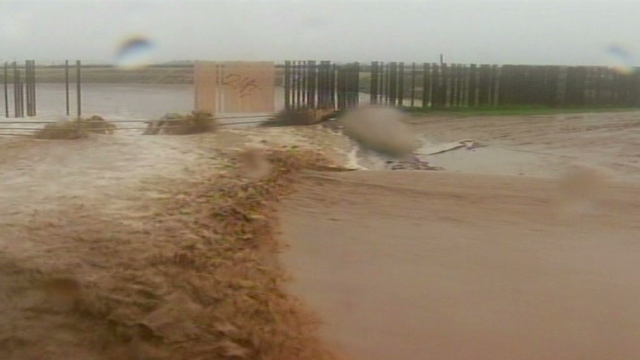 In Arvin, California, near Lamont, Caliente Creek has washed away land near one home. Hugo Figueroa, who lives there, said he and his family were told to evacuate, CNN affiliate KBAK reported. Flooding has washed out several roads near Lamont and Arvin, the station reported. Juan Esquivel said Monday night he would stay awake to keep an eye on near-capacity levees on a storm water basin near his Lamont, California, home. “My concern is that water is going to go in the houses,” he told KBAK. He said he would use sandbags to protect his home if he could. High winds also whipped much of the state, particularly at high elevations. Peak wind gusts reached 152 mph in Alpine Meadows summit in northern California, the weather service reported. Mudslides forced officials to close a portion of State Route 1, also known as the Pacific Coast Highway, in Ventura County from just north of the Los Angeles County line to Oxnard, according to the California Department of Transportation. 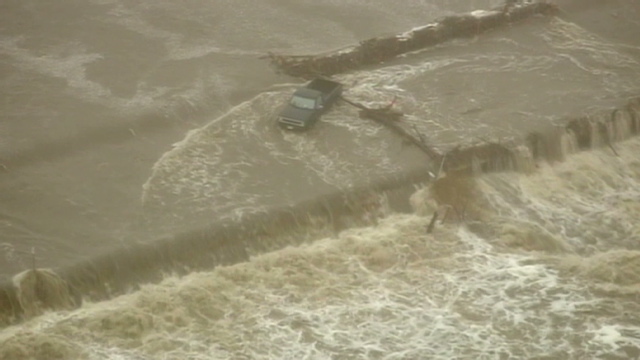 The Pacific Coast Highway was also closed north of Santa Barbara due to flooding. A mudslide also closed a portion of State Route 41 in San Luis Obispo County. 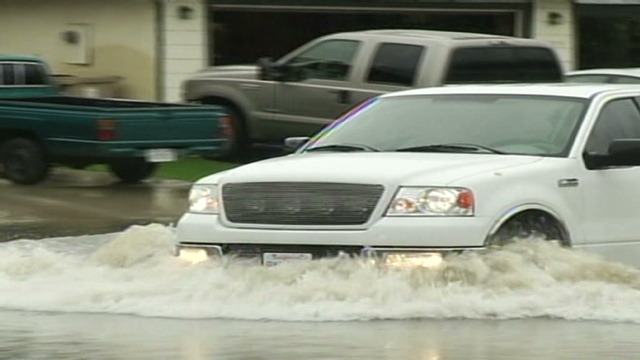 A stretch of State Route 34 in the Oxnard area was closed because of flooding. The danger of mudslides will probably intensify, CNN meteorologist Ivan Cabrera said. “A serious situation will develop now with the mudslide danger that will continue over the next several days,” Cabrera said Monday. Another danger: Falling trees. Erik Budzinski of Orange told CNN affiliate KABC he is heartsick after his vintage 1970 Ford F-150 truck was crushed by a large tree Monday night. “It was my baby,” he said. Budzinski said he was inside his home and heard the wood cracking and popping as the tree fell. “I just knew it,” he said. Still, many southern Californians were not deterred from holiday shopping by the rain, although the rain-slickened roads had led to thousands of accidents. Is He Trying to Tell Us Something? – By Maria Kornalian | Foreign Policy. An Israeli man watches the smoke from the wildfires that hit Haifa, Israel earlier this month, killing 42 people and consuming some 12,000 acres. But Israel is not the only country in the Middle East that has experienced extreme weather in the last few months. All across the region, Middle Eastern cities have been the victim of floods, fires, and snow storms. Israeli firefighters put out flames that destroyed a house in the village of Ein Hod, near the city of Haifa. On Dec 14, Israeli officials canceled a ceremony that was scheduled to honor Palestinian firefighters who helped put out the fire, after three of the firefighters were refused entry into Israel to attend the event. A civilian helps hose off the remains of a burnt house in Ein Hod, during the worst forest fire in the country’s existence. Turkey, Egypt, Jordan, and the Palestinian Authority were among those who offered aid. An Israeli woman, holding the keys to her house, takes a photo of the flames overtaking Israel’s Carmel Mountain. The fires displaced nearly 15,000 civilians and severely damaged 250 homes. Last month’s heavy rains in Saudi Arabia left pilgrims rushing through flooded streets in the holy city of Mecca during the Hajj. Nearly 2.8 million Muslims from all over the world participated in the pilgrimage this year. Cars drive through a fog-covered Cairo in Egypt, where heavy sandstorms and gusts of wind have swept the country. A factory collapse in Alexandria, which was blamed on the bad weather, killed at least three people. Two Lebanese men duck for cover as waves crash up against a wall in a promenade in the Lebanese city of Sidon. Syrian teenagers build a snowman after a snow storm hit Damascus this week, after several months of drought. Syrian authorities also closed the port of Tartous due to high winds. A massive storm hits the eastern Mediterranean, sending waves smashing into the port of Caesarea in Israel. A man looks toward the Lebanese village of Fatri, north of Beirut, which was damaged by one of the 120 fires that broke out in the country earlier this month. Heavy rainfall eventually helped extinguish the fires. No 'Tipping Point' For Arctic Icecap Melting? No ‘Tipping Point’ For Arctic Icecap Melting – Science News – redOrbit. According to a new study released Wednesday, there is no “tipping point” beyond which climate change will eventually push the Arctic icecap into a total melt off. Over the past 30 years the polar icecap has shrunk between 15 and 20 percent causing much concern that with current trends — with regional temperatures increasing two to three times the global average — it could disappear entirely during the summer months by the end of this century. One factor in this calculation is a so-called positive feedback, in which a reduced area of floating ice helps fuel global warming. As ice cover recedes decade by decade, more of the Sun’s radiative force is absorbed by dark-blue sea rather than reflected back into space by ice and snow. But according to the new study, published in the British journal Nature, there is nothing inevitable about this process, and that it can be stopped or even reversed. “There is no ‘tipping point’ that would result in unstoppable loss of summer sea ice when greenhouse gas-driven warming rose above a certain threshold,” said Professor Steven Amstrup of the University of Washington and lead author of the study. Many scientists have worried that there was an as yet unidentified temperature threshold which would eventually doom the icecap. But the study indicates that if annual emission of greenhouse gases are greatly reduced over the next 20 years, an initial phase of rapid loss would be followed by a period of stability and, eventually, partial recovery. If computer models are accurate, that could mean a reprieve for polar bears, which rely on floating ice shelves as staging areas for stalking and hunting its seal prey. Many of the majestic beasts are already teetering on the edge of starvation because the ice melts sooner in springtime and forms later in the fall, shortening their hunting season. The new research “offers a very promising, hopeful message,” said co-author and University of Washington professor Cecilia Blitz. “But it’s also an incentive for mitigating greenhouse gas emissions,” she said in a statement to AFP. In previous research, Amstrup and colleagues had calculated that only a third of the world’s 22,000 polar bears would still be alive by 2050, and that even those surviving animals would most likely disappear. Washington listed polar bears under the Endangered Species Act in 2008. More than 150 biologists and climatologists called on President Barack Obama earlier this week to step up action to save the polar bears. A separate study, also published in Nature on Wednesday, warned that melting sea ice was pushing Arctic mammals to breed with cousin species, a trend that could further push the polar bear and other iconic animals toward extinction. Royal Society paints picture of a world 4 °C warmer – environment – 29 November 2010 – New Scientist. As reported by New Scientist last year, UK Met Office researchers have shown that the world could warm by 4 °C by 2060, devastating much of the Amazon rainforest and disrupting the monsoon cycle. Now the UK’s Royal Society has published detailed study of how the world will look when it is 4 °C warmer. Water shortages will become more severe, says Fai Fung of the University of Oxford, and colleagues. The extent of the warming depends in large part on our actions. If, by cutting emissions we limit global warming to 2 °C, projections suggest water supplies will dwindle because of demand from the growing population. But at 4 °C, a warmer, drier climate will become the biggest threat to water availability. Most of sub-Saharan Africa will see shorter growing seasons, according to Philip Thornton of the International Livestock Research Institute in Nairobi, Kenya, and colleagues. As a result, average maize production will drop 19 per cent and bean production by 47 per cent compared with current levels. Extreme weather, sea-level rise and water shortages will will drive many people to migrate, says François Gemenne of the Institute for Sustainable Development and International Relations in Paris, France. But the poorest may be unable to move. Gemenne says we should make it easier for people to move country.